There is a sinfulle state of dreames…and there may be a night booke of our Iniquities, for beside the transgressions of the day, casuists will tell us of mortall sinnes in dreames arising from evill precogitations; meanwhile human lawe regards not noctambulos, and if a night walker should breake his neck or kill a man, takes no notice of it. I read once about an elderly man who dreamt he was wrestling a stag. The animal thrashed desperately with its antlers but he got an arm round its neck and gave a sharp twist. He woke to find that he had killed his wife of fifty years. One hopes he was a great philanthropist most nights – that he dreamt of curing cancer, bathing lepers or rescuing babies from falling pianos. It might have counterbalanced his transgression. But if we’re culpable for our dreams maybe God is similarly bound by dreams of universal pardon. SAUCE, n. The infallible sign of civilization and enlightenment. A people with no sauces has one thousand vices; a people with one sauce has only nine hundred and ninety-nine. For every sauce invented and accepted a vice is renounced and forgiven. An illustration of the painful path to virtue: I came home last night and found my wife concocting a sauce of red chile peppers. She had roasted them in the oven and the fumes filled the house. I immediately began coughing. There was a sharp pricking at the back of my throat. The floodgates of eyes and nose were thrown wide and I fled to the bedroom until the air was clear. The final result of her labors, however, was beyond tasty – it was another yard won from creeping barbarism. The beauty of the garden was a torture because I could not find the words in which to describe it… I would be seized by a breathless sensation for a moment or two when something real – that is to say some definable vision – would seem to be there, but the moment passed; I would fall into the dreamer’s exhaustion and ennui and a feeling of meaninglessness. Owe your banker £1,000 and you are at his mercy; owe him £1 million and the position is reversed. 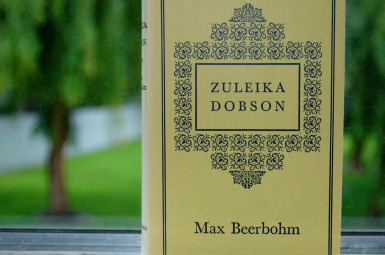 Max Beerbohm’s Zuleika Dobson; William Heinemann, London (1978). Penguin these days is publishing some very attractive collector’s editions of famous novels. I was recently in one of the local corporate bookstores and took a copy of Pride and Prejudice from the shelf to admire the cover art. As lovely as it looked from the outside, however, the quality of the typeface – digitally perfect, utterly regular – was a turn off. Perhaps it’s hard to tell by the photographs here. You’ll have to trust that I was instantly smitten with this book. 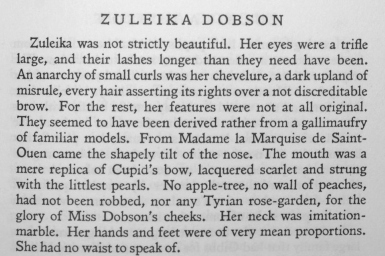 The flimsy, fading dust jacket and loose binding; the high quality of the paper combined with the smudged, uneven application of ink; the inspired choice of typeface, with the upturned ‘e’ that recalls Zuleika’s own “shapely tilt of the nose” – it all adds up to something irresistible. The trick of survival was to accomplish something of no utility, and so small as to be inconspicuous. Berger’s Reinhart is thinking here of the barely perceptible bumps and dents he left in the family home as a child and which are still there years later when everything has been repainted and refurbished. We find it easy to list off our significant influences: parents, teachers, mentors, artists, religious figures and philosophers. But we must also bear the marks of innumerable lesser – even momentary – encounters, long forgotten, of equal or greater importance. Like figures from a polaroid that’s fallen in the water, we bleed into each other. The knocks and nicks and scrapes we carry are as difficult to account for as the final conundrum of our self. Those we give unknowingly to others make up a shadow memorial of our life.